Christmas is twelve days away lovelies - twelve - days - away! If you still feel like you haven't got it together for the festive season, rest assured you're not the only one feeling that way right now *puts up hands* also with the impending Royal Mail strike next week, ordering gifts and expecting them to arrive (even amazon Prime is taking ages to arrive now) then you may be left short. So, the one solution I found to this problem was to order online and have the item directly sent to the recipient (or yourself if you will see your loved one before Christmas) that way you can ensure quick delivery or direct delivery. Most florists use couriers which should bypass the whole Royal Mail escapade that's about to hit us next week. Now don't get me wrong, I love a soft jumper, some shiny shoes and the luxuries of the festive periods but, I don't think you can beat flowers, chocolates and plants. The zanier the better. Especially if your loved one has that sort of personality. 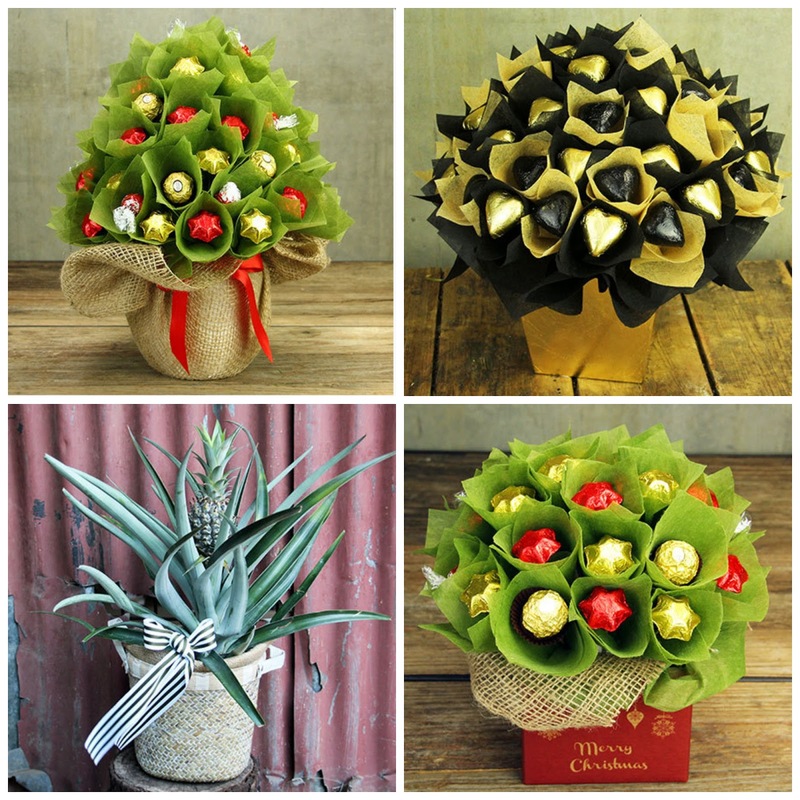 I also particularly adore festive styled flowers such as the ones below from www.flowersforeveryone.com.au. 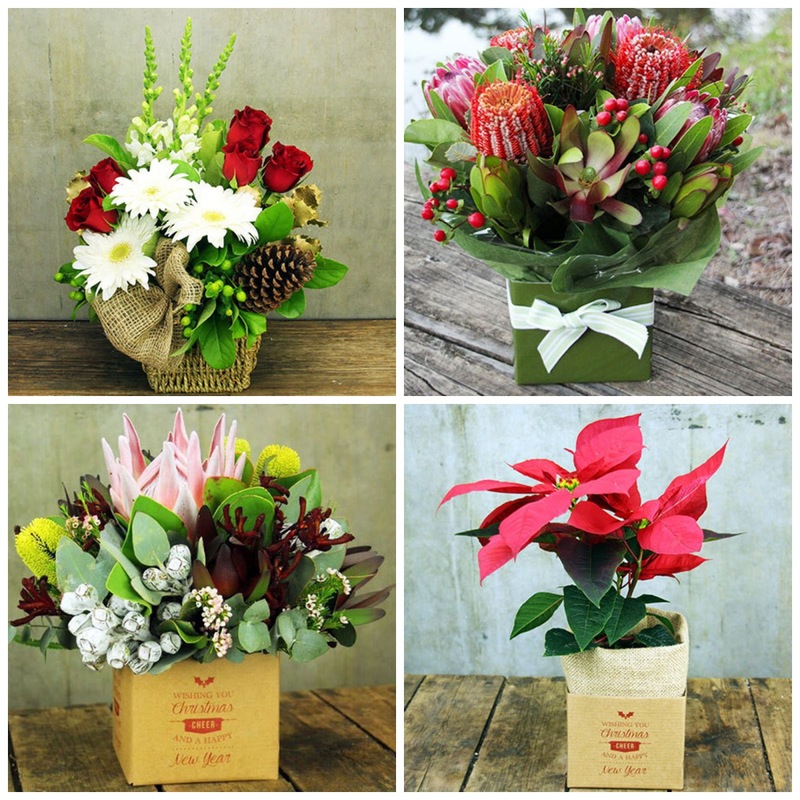 If you stay in Australia then you can check these out over on the Flowers For Everyone Website and I recommend you do as some of their gorgeous flowers are more than gift worthy. They even have zany Willy Wonka Roses! These are like tie dye roses guys, they have tie dye type pastel ones too - you just can't get those here. However, if your giftee isn't into flowers and prefers foodie type gifts why not mix the two? A bouquet of chocolates anyone? Or why not gift a Sweet Pineapple plant? I mean it's a pineapple plant. What's not to love about it. Note also that they have varied packaging colours for their chocolate bouquets. I love the festive reds and golds, but you know some people may prefer a more neutral palette of black and gold or even pastels (also available on the website). There is also the option of sending nappy cakes to new parents or plants. Take for example the gorgeous seasonal poinsettia plant. I adore these plants as they go with all interiors, don't give off horrible smells, don't stain your house with pollen and are a dream to keep alive. If you don't stay in Australia, why not take inspiration from these and also seek out some suitable flower or alternative bouquet gifts that can be sent directly to your loved ones this Christmas? Which of the flowers or alternative gifts would you have loved to receive this year?